The Connecticut Sun will be celebrating youth basketball players throughout the 2019 season with the Youth Baller Membership. Available to any youth basketball player and his or her family in New England, the Youth Baller Membership is priced at just $99. 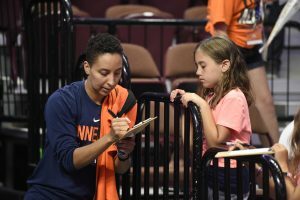 The membership includes a ticket to every Sun game throughout the 2019 season, a clinic led by Connecticut Sun players, as well as a 10 percent discount at both merchandise and concessions. To purchase the membership or for more information click HERE.